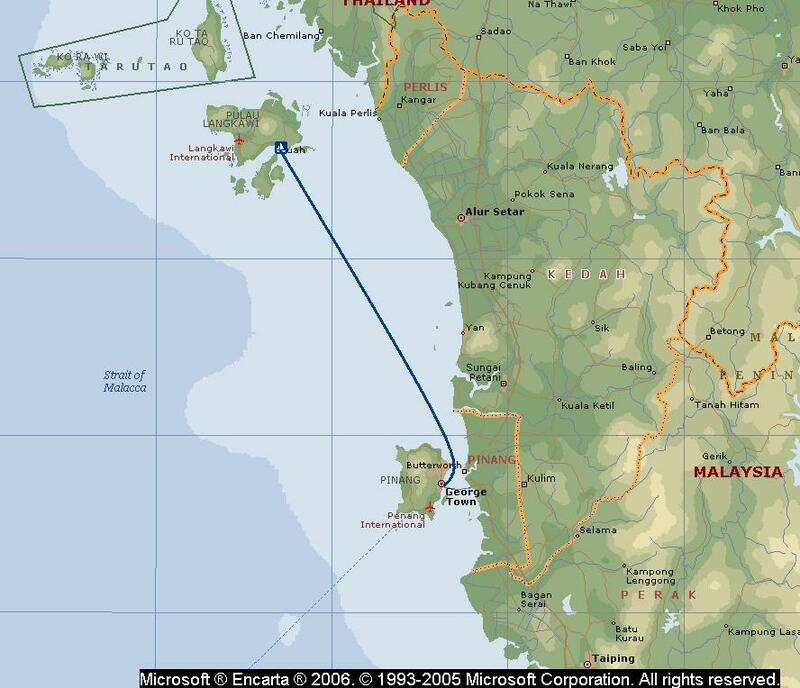 The planned mid January departure from Langkawi to the Andaman Islands was delayed until the end of February by the requirement to buy and install a new single-side band radio. 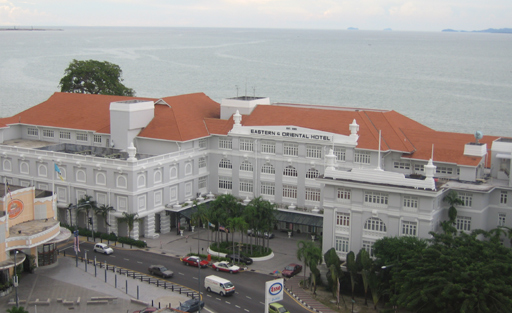 The delay provided the opportunity to celebrate Jane's birthday at the Eastern & Oriental Hotel in Georgetown on Penang. 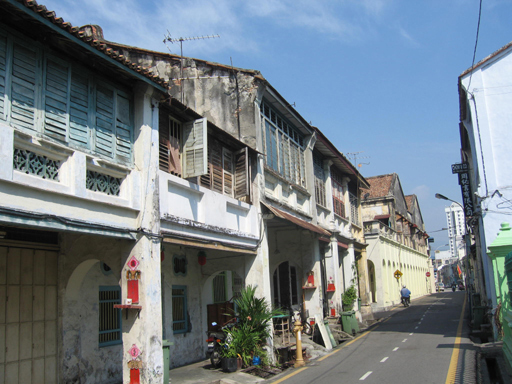 Georgetown is the main city on the island of Penang and is the oldest British settlement in the Melaka Straits. 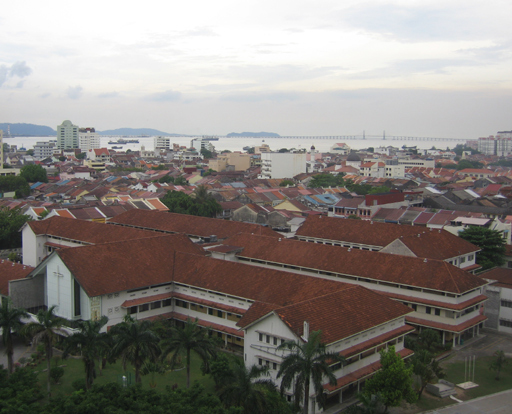 It predates both Melaka and Singapore. The central part of the city has largely, though not completely, escaped the destructive modernizing forces that have attacked the historic parts of Singapore and Hong Kong and it is in the process of being nominated for inclusion on the UNESCO world heritage list. 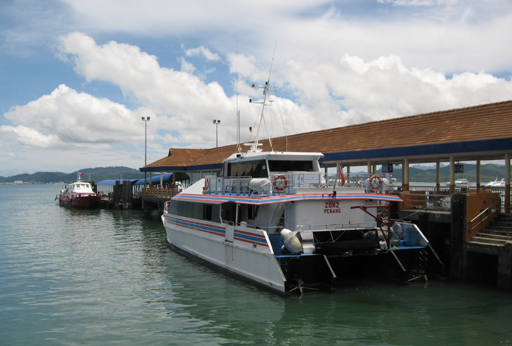 The high speed ferry from Langkawi to Penang takes about a 3.5 hours in good weather. The Eastern & Oriental hotel was chosen for the first visit to Georgetown, because Jane had visited this grand old colonial hotel in 1990 during a National War College trip. During that visit the hotel was looking pretty sad, in 2001 an extensive renovation was completed and she wanted to see the results. The results were good, it was an appropriate setting for a fine dinner and a nice bottle of wine to commemorate Jane's birthday. Georgetown is a fun city to explore. 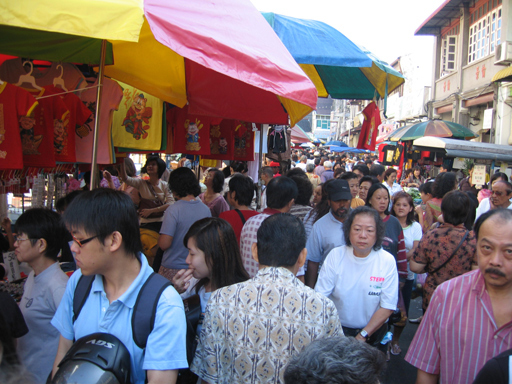 It still has an old colonial charm and a teeming Chinese street market. It more closely meets our preconceived image of what SE Asia would be like than does either Langkawi or Phuket. We made several visits to Georgetown this year and always enjoy the city. 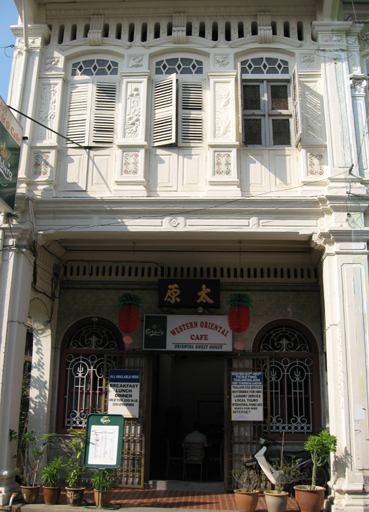 The shophouse style of architecture is both unique to SE Asia and ubiquitous in old urban areas. Typically it has a shop on the ground floor and a residence on the upper floors, as seen on the left. 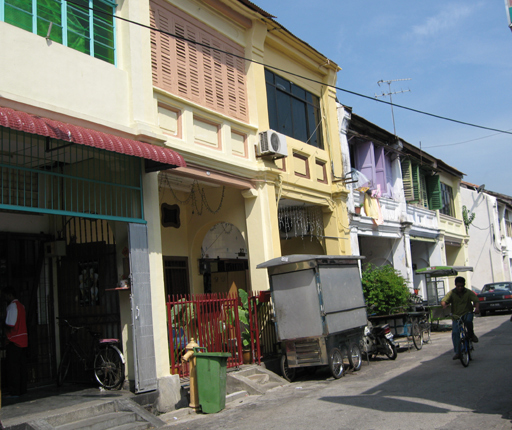 Recently, it is becoming fashionable to restore them for town houses as on the right. 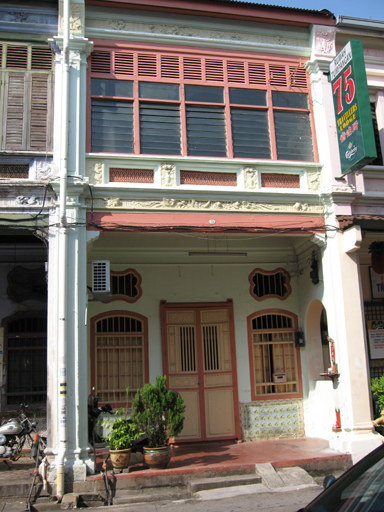 The earliest examples of shophouse architecture had the residents living close to the roof. Later styles raised the roof to provide ventilation. Unfortunately, like elsewhere, land values are increasing and more profitable use can be made of the land under these historic structures. Lack of maintenance, willful destruction and mysterious fires have taken their toll. 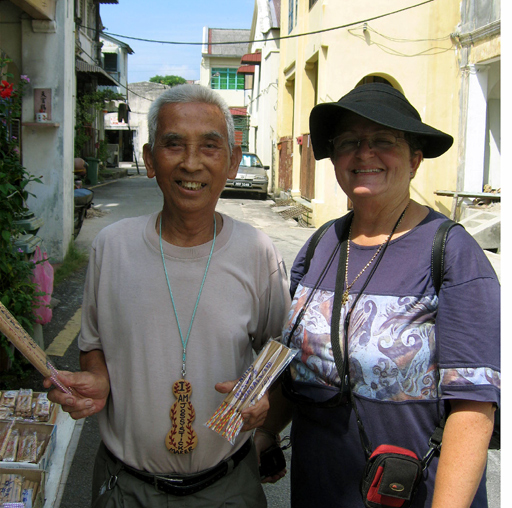 A few of the traditional crafts are still active, but most of the practitioners are old and will not be replaced by the current generation. 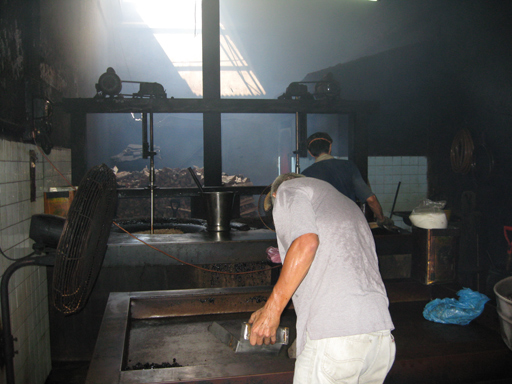 On the left a family still roast coffee in a wood fired roaster and the josh stick maker on the right still uses Indian sandalwood and makes his products by hand. 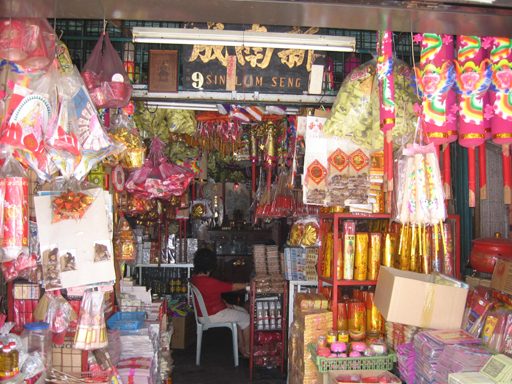 This colorful shop sells items for use in the temples, most of the josh sticks are made in China. 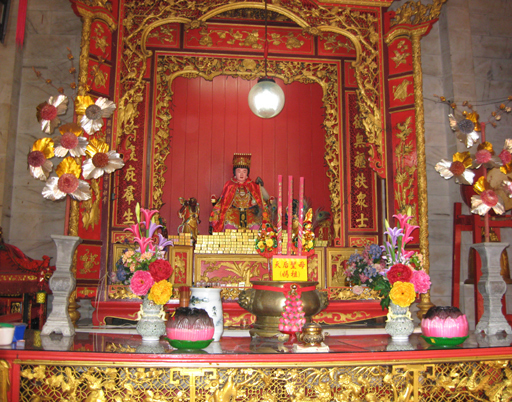 Although, Chinese temples always contain icons of several different Gods, they are usually dedicated to a principle God. Their Gods have areas of special interest like Christian Saints ie, St. Elmo looks after sailors and St. Jude is the patron of lost causes. This Hainan Temple is dedicated to Than Hau, the patron of seafarers, of which we took special notice. 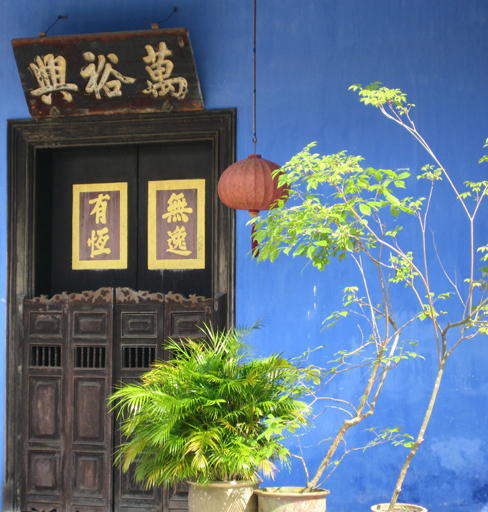 The Cheong Fatt Tze mansion was built in the late 1800's by one of the richest men in all of SE Asia and is an excellent example of classical Chinese architecture. 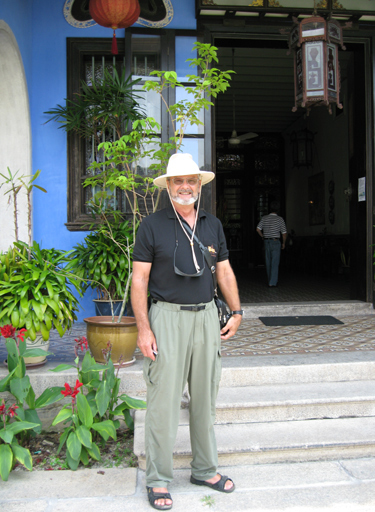 It survives today as a boutique guest house in old Georgetown. It is proposed for the UNESCO World Heritage listing. 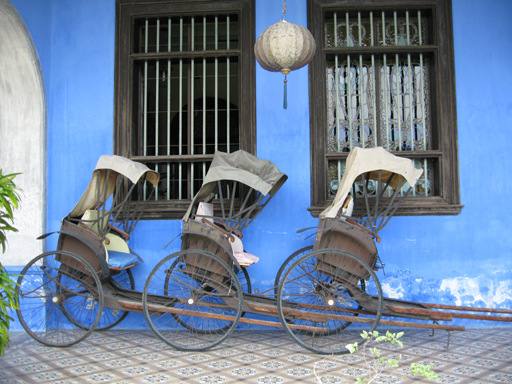 Rickshaws have long since been replaced by the trishaw, which is a pedal-powered equivalent, but these are on display at the Cheong Fatt Tze mansion. This is a great city to just poke around in, we hope we will return to see more of it in the near future.